Read the following information carefully. Clicking on the Payment Button below confirms that you have read and agree to all terms and conditions. 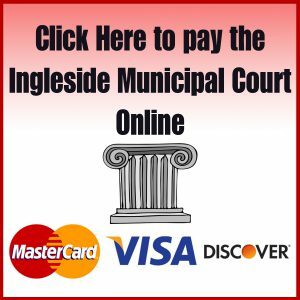 Ingleside Municipal Court provides the ability to make payments over the Internet. Notices, exclusions, and explanations should be read carefully before proceeding. Payments are allowed by Credit Card only. This service can be used to pay any eligible traffic or criminal offense in full. Pleas or payment arrangements CANNOT be made over the phone or internet. Your appearance in court on the date shown on your ticket will be waived if fine/costs are paid prior to that date. Your court date appears in the lower right hand corner of your citation. You CAN use this service to pay capias warrants and standard warrants that have not been set for trial. If you are seeking to have any violations dismissed, you SHOULD NOT use this service, and should contact the Court at (361)775-1188. You CAN use this service with prior approval from the court to pay for any alternative sentencing option such as a compliance dismissal fee, driving safety course or deferred disposition. If you are 24 or younger at the time of your citation, you will need to take a driving safety course as a requirement of your deferred disposition. You CANNOT use this service to pay the fine/costs for any ticket issued to a juvenile. All defendants 16 or under must appear before the Judge accompanied by a parent or legal guardian. In the event of an alcohol related offense, all persons 17 or under must be accompanied by a parent or legal guardian. You CANNOT use this service to pay the fine/costs for a person in jail. You CANNOT use this service to pay a cash bond. Your use of this service to pay fine/costs, in accordance with Texas Code of Criminal Procedure, Art. 27.14(c), constitutes a finding of guilty in open court as though a plea of nolo contendere had been entered by the defendant and constitutes a waiver of a jury trial in writing. Your use of this service to pay fine/costs will result in a conviction being reported to the Texas Department of Public Safety. The City of Ingleside and the Ingleside Municipal Court make no guarantees, promises, or warranties regarding the accuracy of information provided in this site. There is no guarantee that this online payment service will show all of your unpaid tickets. Use of this service to submit payment constitutes acknowledgement that the City of Ingleside and the processor of the electronic payments assume no responsibility for data entered by service users. When using a debit/credit card to pay online, your bank may place a monetary “hold(s)” on your account for several days. The Court is not responsible for any holds and has no control over how long your bank holds these funds. Please contact the bank issuing your debit/credit card with any questions. Clicking on the Payment Button below confirms that I have read the above and agree to all terms and conditions.